Congratulations to Wes Peden for winning the Lublin 2016 Fight Night on Saturday. In the first tournament of the 2016 season, which also happened to be in Lublin, Wes's fellow Sweden-based American juggler Jay Gilligan lost in the final against Jakub Szwed, but Wes was able to go one better. This is Wes Peden's first Fight Night victory. Back in 2007 at the British Juggling Convention he came close, but was defeated in the final by Aaron Gregg, mostly due to questionable umpiring decisions. More recently he has lost in the round of 8 at the Israel 2015 and NJF 2015 Fight Nights. In Lublin Wes qualified top of his group and had little trouble reaching the final. There he beat the second ranked Polish player, Artur Perskawiec. Amadeusz Kołak came third and Marek Żmuda fourth. Marek beat the top ranked Polish player and the number 1 seed, Jakub Szwed, in his round of 8 match. 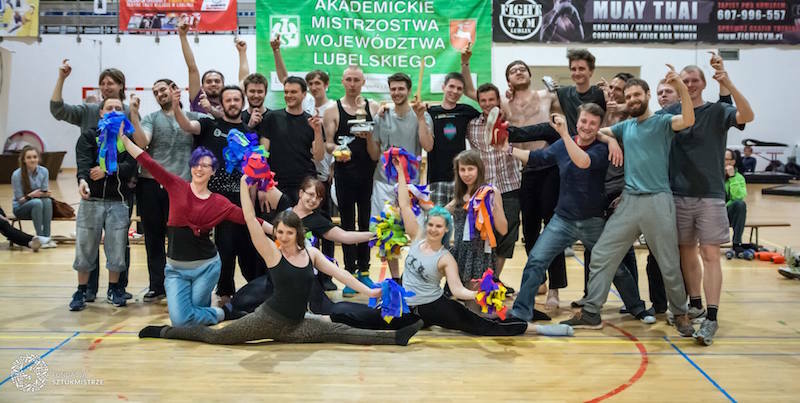 26 jugglers took part in the Lublin 2016 Fight Night, making it one of the biggest of the year so far. Wes wins 500 points for his first FNC title, and he enters the 2016 Race Rankings in 9th place. Artur moves up to 7th place in 2016 so far, and up one place to 16th in the 52 Week Current Rankings. Watch out for news from three Fight Nights taking place this week. On Wednesday there will be Bungay Balls Up in England, on Thursday the first ever Fight Night in Bogota, Colombia, and on Friday the second Fight Night in Galway, Ireland.